First, a huge infusion of money (none of this timid stuff, which Krugman reminds us is what had FDR triggering a double-dip depression in the late 1930s) from the feds to the states, so they can start re-hiring those teachers and public sector workers. Second: debt relief, starting with mortgage debt and soon extending to other areas like student loans. Third — then we get into monetary policy, and not even Bud Johns and Paul Krugman can explain that to yours truly in adequately simplified terms. So the national debt remains staggering and everybody worries about what we’re bequeathing our grandchildren. At least we might keep the country afloat, mass desperation relieved and families together, and that would be something to bequeath. 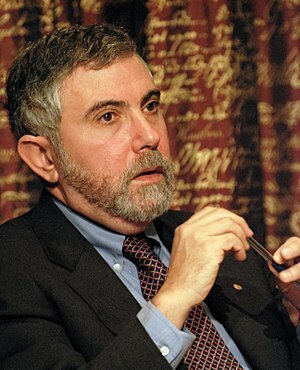 Paul Krugman did not approve this over-simplified message. But he still gets my vote. Right on, Fran! You are my newest Bookmark. I look forward to more of your savvy posts.